Julie Swarstad Johnson is the author of Jumping the Pit (Finishing Line Press, 2015). Her poems and reviews have appeared or are forthcoming in The Hollins Critic, Passages North, Harvard Review Online, and others. She lives in Tucson, Arizona, and works at the University of Arizona Poetry Center. 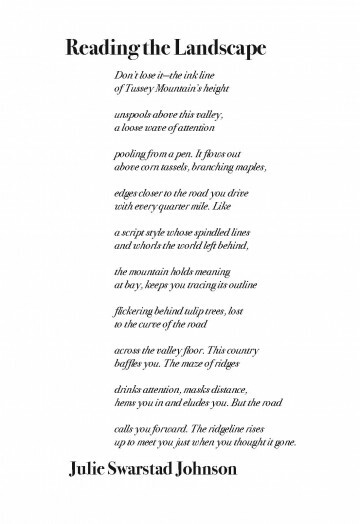 The poet gets at something essential here: “Like/ a script style whose spindled lines/ and whorls the world left behind, / the mountain holds meaning/ at bay, keeps you tracing its outline.” There’s mystery to mountains despite their solidity; like handwriting, they’re easy to recognize but hard to decipher. There’s mystery in their contradictory effects, too: how they both “hem you in and elude you.” Perhaps what fascinates most, though, is how something so big, so permanent, can be so changeable, “ris[ing]/ up to meet you just when you thought it gone.” Tussey Mountain will never leave this speaker, nor will it ever fully reveal itself. “Don’t lose it—the ink line… unspools… a loose wave… pooling…” With all those Os, how could this poem be set in anything other than Bodoni italic? The contrast between thick and thin strokes, all leaning to the right, gives the o a sense of rolling movement that echoes the speaker’s own. Then there’s the lower case g, evocative of winding mountain roads where, if you’re not careful, you’ll end up “lost/ to the curve” of its form. It’s a mystery how Bodoni can be so visually engaging while remaining smoothly readable. It seems the perfect choice for a poem evoking the landscape of the American West, where the expanse both inspires and humbles.